First impressions is a segment that is, well, just what it says it is. Most reviews (games, movies, books, etc…) that i post will have a first impressions reviews or thoughts page. I have been playing the game for about 5 hours and i can say that i want more. I’m really into this game and cant put it down. I must say that this game could stand on its own two legs without the final fantasy element. FF parts are all gravy. I mean playing as a precious moments version of cloud in a rhythm RPG is never a bad thing. it just screams nostalgia. You play using the stylus only so Ive found having a bigger stylus really helps. When you start you set up a four person team that you level up and equip items to each person on the team. You can change them around at anytime or leave them as is and start a new game with a new team. Each FF game is a stage, with each stage having 3 main parts. Each part of each stage has a different style of gameplay which is welcomed and keeps the gameplay from going stale. 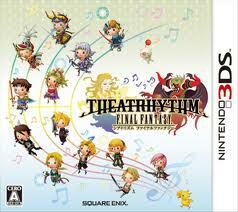 The rhythm part of game is broken into three parts and is very fun and rewarding at times. It has a two modes of skill on the man game basic and expert. its kinda of like going from the plate to the frying pan with no buffer once you get to know the game play. This is not a game you want to just jump into the expert mode and start playing. The game can be challenging and hard, but not in a frustrating way to where you want to throw the game and smash it. Its more like the kind of hard that feels very much rewarding and relieved when you complete a part of a stage. so far there seems to be plenty to do to keep me engaged and wanting more. so when i complete the game i can see my self coming back again and again. This is only a first impression and a full review will be coming next week. But if you like these type of games or are looking at trying one out you cant find a better game on the 3ds. My first impression score is- 4.5/5 and check out the final review next week.